"Mother of pearl" redirects here. For other uses, see Mother of pearl (disambiguation). Nacre (/ˈneɪkər/ NAY-kər also /ˈnækrə/ NAK-rə), also known as mother of pearl, is an organic-inorganic composite material produced by some molluscs as an inner shell layer; it also makes up the outer coating of pearls. It is strong, resilient, and iridescent. Nacre is found in some of the most ancient lineages of bivalves, gastropods, and cephalopods. However, the inner layer in the great majority of mollusc shells is porcellaneous, not nacreous, and this usually results in a non-iridescent shine, or more rarely in non-nacreous iridescence such as flame structure as is found in conch pearls. The outer layer of pearls and the inside layer of pearl oyster and freshwater pearl mussel shells are made of nacre. Other mollusc families that have a nacreous inner shell layer include marine gastropods such as the Haliotidae, the Trochidae and the Turbinidae. Nacre is composed of hexagonal platelets of aragonite (a form of calcium carbonate) 10–20 µm wide and 0.5 µm thick arranged in a continuous parallel lamina. Depending on the species, the shape of the tablets differ; in Pinna, the tablets are rectangular, with symmetric sectors more or less soluble. Whatever the shape of the tablets, the smallest units they contain are irregular rounded granules. These layers are separated by sheets of organic matrix (interfaces) composed of elastic biopolymers (such as chitin, lustrin and silk-like proteins). This mixture of brittle platelets and the thin layers of elastic biopolymers makes the material strong and resilient, with a Young's modulus of 70 GPa (when dry). Strength and resilience are also likely to be due to adhesion by the "brickwork" arrangement of the platelets, which inhibits transverse crack propagation. This structure, at multiple length sizes, greatly increases its toughness, making it almost as strong as silicon. The statistical variation of the platelets has a negative effect on the mechanical performance (stiffness, strength, and energy absorption) because statistical variation precipitates localization of deformation . However, the negative effects of statistical variations can be offset by interfaces with large strain at failure accompanied by strain hardening . On the other hand, the fracture toughness of nacre increases with moderate statistical variations which creates tough regions where the crack gets pinned . But, higher statistical variations generates very weak regions which allows the crack to propagate without much resistance causing the fracture toughness decreases . Nacre appears iridescent because the thickness of the aragonite platelets is close to the wavelength of visible light. These structures interfere constructively and destructively with different wavelengths of light at different viewing angles, creating structural colours. The crystallographic c-axis points approximately perpendicular to the shell wall, but the direction of the other axes varies between groups. Adjacent tablets have been shown to have dramatically different c-axis orientation, generally randomly oriented within ~20° of vertical. In bivalves and cephalopods, the b-axis points in the direction of shell growth, whereas in the monoplacophora it is the a-axis that is this way inclined. The interlocking of bricks of nacre has large impact on both the deformation mechanism as well as its toughness. In addition, the mineral–organic interface results in enhanced resilience and strength of the organic interlayers. Nacre formation is not fully understood. The initial onset assembly, as observed in Pinna nobilis, is driven by the aggregation of nanoparticles (~50–80 nm) within an organic matrix that arrange in fibre-like polycrystalline configurations. The particle number increases successively and, when critical packing is reached, they merge into early-nacre platelets. Nacre growth is mediated by organics, controlling the onset, duration and form of crystal growth. Individual aragonite "bricks" are believed to quickly grow to the full height of the nacreous layer, and expand until they abut adjacent bricks. This produces the hexagonal close-packing characteristic of nacre. Bricks may nucleate on randomly dispersed elements within the organic layer, well-defined arrangements of proteins, or may grow epitaxially from mineral bridges extending from the underlying tablet. Nacre differs from fibrous aragonite – a brittle mineral of the same form – in that the growth in the c-axis (i.e., approximately perpendicular to the shell, in nacre) is slow in nacre, and fast in fibrous aragonite. Fossil nautiloid shell with original iridescent nacre in fossiliferous asphaltic limestone, Oklahoma. Dated to the late Middle Pennsylvanian, which makes it by far the oldest deposit in the world with aragonitic nacreous shelly fossils. Nacre is secreted by the epithelial cells of the mantle tissue of various molluscs. The nacre is continuously deposited onto the inner surface of the shell, the iridescent nacreous layer, commonly known as mother of pearl. The layers of nacre smooth the shell surface and help defend the soft tissues against parasites and damaging debris by entombing them in successive layers of nacre, forming either a blister pearl attached to the interior of the shell, or a free pearl within the mantle tissues. The process is called encystation and it continues as long as the mollusc lives. The form of nacre varies from group to group. In bivalves, the nacre layer is formed of single crystals in a hexagonal close packing. In gastropods, crystals are twinned, and in cephalopods, they are pseudohexagonal monocrystals, which are often twinned. The main commercial sources of mother of pearl have been the pearl oyster, freshwater pearl mussels, and to a lesser extent the abalone, popular for their sturdiness and beauty in the latter half of the 19th century. Widely used for pearl buttons especially during the 1900s, were the shells of the great green turban snail Turbo marmoratus and the large top snail, Tectus niloticus. The international trade in mother of pearl is governed by the Convention on International Trade in Endangered Species of Wild Fauna and Flora, an agreement signed by more than 170 countries. Altarpiece, circa 1520, with extensive use of carved nacre. Nacre gunpowder flask, circa 1750, mostly consisting of the polished shell of a large sea snail Turbo marmoratus. Inlay with nacre tesserae, Baghdad pavilion, Topkapı Palace, Istanbul. 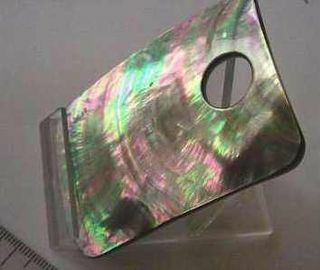 Nacreous shell worked into a decorative object. Both black and white nacre are used for architectural purposes. The natural nacre may be artificially tinted to almost any color. Nacre tesserae may be cut into shapes and laminated to a ceramic tile or marble base. The tesserae are hand-placed and closely sandwiched together, creating an irregular mosaic or pattern (such as a weave). The laminated material is typically about 2 millimetres (0.079 in) thick. The tesserae are then lacquered and polished creating a durable and glossy surface. Instead of using a marble or tile base, the nacre tesserae can be glued to fiberglass. The result is a lightweight material that offers a seamless installation and there is no limit to the sheet size. Nacre sheets may be used on interior floors, exterior and interior walls, countertops, doors and ceilings. Insertion into architectural elements, such as columns or furniture is easily accomplished. Mother of pearl buttons are used in clothing either for functional or decorative purposes. The Pearly Kings and Queens are an elaborate example of this. Nacre is also used to decorate watches, knives, guns and jewellery. Nacre inlay is often used for music keys and other decorative motifs on musical instruments. Many accordion and concertina bodies are completely covered in nacre, and some guitars have fingerboard or headstock inlays made of nacre (as well as some guitars having plastic inlays designed to imitate the appearance of nacre). The bouzouki and baglamas (Greek plucked string instruments of the lute family) typically feature nacre decorations, as does the related Middle Eastern oud (typically around the sound holes and on the back of the instrument). Bows of stringed instruments such as the violin and cello often have mother of pearl inlay at the frog. It is traditionally used on saxophone keytouches, as well as the valve buttons of trumpets and other brass instruments. Mother of pearl is sometimes used to make spoon-like utensils for caviar, so as to not spoil the taste with metallic spoons. In 2012, researchers created calcium-based nacre in the laboratory by mimicking its natural growth process. In 2014, researchers used lasers to create an analogue of nacre by engraving networks of wavy 3D "micro-cracks" in glass. When the slides were subjected to an impact, the micro-cracks absorbed and dispersed the energy, keeping the glass from shattering. Altogether, treated glass was reportedly 200 times tougher than untreated glass. 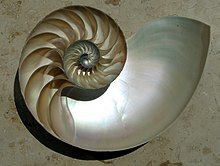 ^ Definition of nacre at dictionary.com. ^ a b Nudelman, Fabio; Gotliv, Bat Ami; Addadi, Lia; Weiner, Steve (2006). "Mollusk shell formation: Mapping the distribution of organic matrix components underlying a single aragonitic tablet in nacre". Journal of Structural Biology. 153 (2): 176–87. doi:10.1016/j.jsb.2005.09.009. PMID 16413789. ^ Cuif J.P. Dauphin Y., Sorauf J.E. (2011). Biominerals and fossils through time. Cambridge: Cambridge University Press. ISBN 9780521874731. OCLC 664839176. ^ Jackson, A. P.; Vincent, J. F. V; Turner, R. M. (1988). "The mechanical design of nacre". Proceedings of the Royal Society B: Biological Sciences (published 22 Sep 1988). 234 (1277): 415–440. doi:10.1098/rspb.1988.0056. JSTOR 36211. Retrieved 2013-11-12. ^ a b Abid, N.; Mirkhalaf, M.; Barthelat, F. (2018). "Discrete-element modeling of nacre-like materials: effects of random microstructures on strain localization and mechanical performance". Journal of the Mechanics and Physics of Solids. 112: 385–402. doi:10.1016/j.jmps.2017.11.003. ^ a b Abid, N.; Pro, J. W.; Barthelat, F. (2019). "Fracture mechanics of nacre-like materials using discrete-element models: Effects of microstructure, interfaces and randomness". Journal of the Mechanics and Physics of Solids. 124: 350–365. doi:10.1016/j.jmps.2018.10.012. ^ Metzler, Rebecca; Abrecht, Mike; Olabisi, Ronke; Ariosa, Daniel; Johnson, Christopher; Frazer, Bradley; Coppersmith, Susan; Gilbert, PUPA (2007). "Architecture of columnar nacre, and implications for its formation mechanism". Physical Review Letters. 98 (26): 268102. doi:10.1103/PhysRevLett.98.268102. PMID 17678131. ^ Olson, Ian; Kozdon, Reinhard; Valley, John; Gilbert, PUPA (2012). "Mollusk shell nacre ultrastructure correlates with environmental temperature and pressure". Journal of the American Chemical Society. 134 (17): 7351–7358. doi:10.1021/ja210808s. PMID 22313180. ^ a b c d Checa, Antonio G.; Ramírez-Rico, Joaquín; González-Segura, Alicia; Sánchez-Navas, Antonio (2008). "Nacre and false nacre (foliated aragonite) in extant monoplacophorans (=Tryblidiida: Mollusca)". Naturwissenschaften. 96 (1): 111–22. doi:10.1007/s00114-008-0461-1. PMID 18843476. ^ Katti, Kalpana S.; Katti, Dinesh R.; Pradhan, Shashindra M.; Bhosle, Arundhati (2005). "Platelet interlocks are the key to toughness and strength in nacre". Journal of Materials Research. 20 (5): 1097. doi:10.1557/JMR.2005.0171. ^ Ghosh, Pijush; Katti, Dinesh R.; Katti, Kalpana S. (2008). "Mineral and Protein-Bound Water and Latching Action Control Mechanical Behavior at Protein-Mineral Interfaces in Biological Nanocomposites". Journal of Nanomaterials. 2008: 1. doi:10.1155/2008/582973. ^ Mohanty, Bedabibhas; Katti, Kalpana S.; Katti, Dinesh R. (2008). "Experimental investigation of nanomechanics of the mineral-protein interface in nacre". Mechanics Research Communications. 35 (1–2): 17. doi:10.1016/j.mechrescom.2007.09.006. ^ Ghosh, Pijush; Katti, Dinesh R.; Katti, Kalpana S. (2007). "Mineral Proximity Influences Mechanical Response of Proteins in Biological Mineral−Protein Hybrid Systems". Biomacromolecules. 8 (3): 851–6. doi:10.1021/bm060942h. PMID 17315945. ^ Hovden, Robert; Wolf, Stephan; Marin, Frédéric; Holtz, Meganc; Muller, David; Lara, Estroff (2015). "Nanoscale assembly processes revealed in the nacroprismatic transition zone of Pinna nobilis mollusc shells". Nature Communications. 6: 10097. doi:10.1038/ncomms10097. PMC 4686775. PMID 26631940. ^ Jackson, D. J.; McDougall, C.; Woodcroft, B.; Moase, P.; Rose, R. A.; Kube, M.; Reinhardt, R.; Rokhsar, D. S.; et al. (2009). "Parallel Evolution of Nacre Building Gene Sets in Molluscs". Molecular Biology and Evolution. 27 (3): 591–608. doi:10.1093/molbev/msp278. PMID 19915030. ^ Addadi, Lia; Joester, Derk; Nudelman, Fabio; Weiner, Steve (2006). "Mollusk Shell Formation: A Source of New Concepts for Understanding Biomineralization Processes". ChemInform. 37 (16). doi:10.1002/chin.200616269. ^ Schäffer, Tilman; Ionescu-Zanetti, Cristian; Proksch, Roger; Fritz, Monika; Walters, Deron; Almquist, Nils; Zaremba, Charlotte; Belcher, Angela; Smith, Bettye; Stucky, Galen (1997). "Does abalone nacre form by heteroepitaxial nucleation or by growth through mineral bridges?". Chemistry of Materials. 9 (8): 1731–1740. doi:10.1021/cm960429i. ^ Checa, Antonio; Cartwright, Julyan; Willinger, Marc-Georg (2011). "Mineral bridges in nacre". Journal of Structural Biology. 176 (3): 330–339. doi:10.1016/j.jsb.2011.09.011. PMID 21982842. ^ Bruce Runnegar & S Bengtson. "1.4" (PDF). Origin of Hard Parts — Early Skeletal Fossils. ^ Buckhorn Lagerstätte of Oklahoma Click on photo for more information. ^ Aron, Jacob (24 July 2012). "Artificial mother of pearl follows nature's recipe". New Scientist. ^ "Super-tough glass based on mollusk shells". Gizmag.com. Retrieved 2014-02-13. Frýda, J.; Bandel, K.; Frýdová, B. (2009). "Crystallographic texture of Late Triassic gastropod nacre: evidence of long-term stability of the mechanism controlling its formation". Bulletin of Geosciences. 84 (4): 745–754. doi:10.3140/bull.geosci.1169. Lin, A.; Meyers, M.A. (2005-01-15). "Growth and structure in abalone shell". Materials Science and Engineering A. 390 (1–2): 27–41. doi:10.1016/j.msea.2004.06.072. Archived from the original on 2007-05-05. Mayer, G. (2005). "Rigid biological systems as models for synthetic composites". Science. 310 (5751): 1144–1147. doi:10.1126/science.1116994. PMID 16293751. Bruet, B.; Qi, H.J. ; Boyce, M.C. ; Panas, R.; Tai, K.; Frick, L.; Ortiz, C. (2005). "Nanoscale morphology and indentation of individual nacre tablets from the gastropod mollusc Trochus niloticus" (PDF). J. Mater. Res. 20 (9): 2400. doi:10.1557/JMR.2005.0273. Abid, N.; Mirkhalaf, M.; Barthelat, F. (2018). "Discrete-element modeling of nacre-like materials: Effects of random microstructures on strain localization and mechanical performance". Journal of the Mechanics and Physics of Solids. 112: 385-402. doi:10.1016/j.jmps.2017.11.003. Wikimedia Commons has media related to Nacre. Look up nacre in Wiktionary, the free dictionary. This page was last edited on 2 April 2019, at 16:55 (UTC).